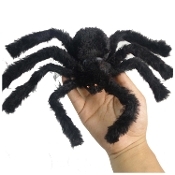 Foam Tarantula Spider Body, covered in spooky black poly satin fabric and fake fur, with chenille wire legs and jewel tone plastic bead eyes in assorted gold or red color. Features posable wire legs that can be shaped or posed to your preference, and fine ribbon at mid-section, where your own hanger hook, string or clear fishing line can be attached for hanging. Can be hung with your own *string (*hanging string NOT included) over doors, windows, shelves, cupboards, etc, or makes a perfect centerpiece for your Halloween table decorations, crafts and accents for Halloween Costume or Accessories. Accented with assorted red or gold jewel eyes.